The newest member of the Blue Water Candy premier JAG series. These skirts are assembled with the finest nylon and mylar fibers available. The sensational two-tone paint jobs and molded eyes make for some of the most attractive heads in the industry. 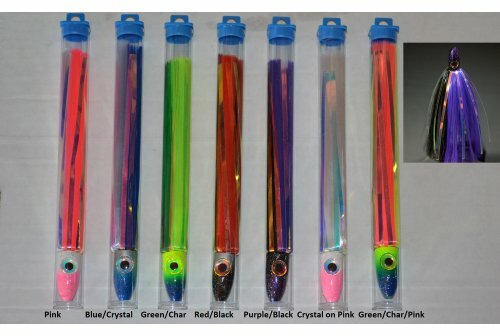 Great for dredges, daisy chains, and nose baits. 1¾ ounces in weight. 8” overall length. Use with mono up to 300#. Contact us for custom colors! Order 12 or more & save!